Investor Juan: Is Now a Good Time to Invest in Stocks? Hello sir, great blog! I'm new to investing, and I'm considering investing in BDO UITFs. Considering their great performance last year, I was wondering if this means there's nowhere to go but down from here? Sorry if it might seem like a stupid question, but I'm just worried that investing now would just be the equivalent of buying high then selling low later. Do UITFs work that way? Or would fund managers work behind the scenes by hunting and investing on low-priced stocks that can still go up, and keep this trend going? The most widely believed explanation for the great run which started in September of last year and pushed the PSEi to a high of around 4,400 in early November is the surge of "hot money", a huge sum foreign capital that flows in and out of local markets. The problem with hot money is that, unlike more permanent forms of capital inflows like foreign direct investments or FDIs (when foreign investors actually invest in real assets like real property, offices, and buildings or form actual businesses), the speed at which it can enter and leave markets can result in "bubbles" that can wipe out smaller investors when they burst. In the last quarter of 2010, big foreign investors became tired of the slow recovery of the US from the financial crisis and the instability of financial markets in Europe, and decided to move a huge amount of capital from those markets to developing economies in Asia like the Philippines and Indonesia. Perhaps the strongest evidence that the rapid rise in stock prices in Manila in that period was due to hot money, and not because Philippine companies all of a sudden became more profitable and fundamentally sound, is that the same thing was happening to our Southeast Asian neighbors at the same time, sometimes at even at higher growth rates. What has happened since December of last year is that these foreign investors have started to become more confident of the US economy, and so have decided to pull out of our markets and reinvest in US companies. 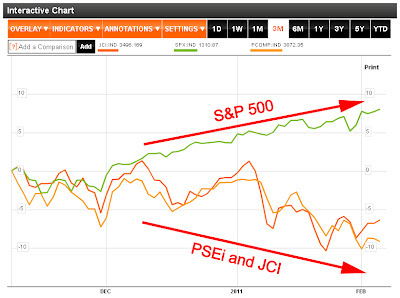 The graph below clearly shows that since early December when US stocks, represented by the S&P 500 Index, have started to rally, Philippine (PSEi) and Indonesian (JCI) stocks have followed an opposite, downward trend. So is now a good time to invest in Philippine equities, in general? Yes, I think so, since prices are now at a more sustainable level. Is it the best time to invest in equities now? That, I am not so sure of. It's possible that the outflow of foreign capital from the market will continue to depress prices, but I think it's highly unlikely; the actual performance and prospects of Philippine companies should be enough to justify the stock price gains last year and possible further increases this year. Also, the long run relationship between the US stocks and Philippine stocks is positive, so despite the inverse relationship we are seeing now, US and Philippine stocks should eventually move in the same direction. As for your other question, yes, strictly UITFs are actively managed funds where fund managers can and should adjust the composition of the fund to maximize returns for unit holders (that's what unit holders pay the management fee for), subject of course to general constraints defined by the kind of fund (for example, 80% of equity funds should be invested in stocks and 20% in fixed income instruments, while balanced funds should have a 60/40 mix, or however the funds are defined in the fund fact sheet). But what actually happens is that UITF fund managers invest conservatively and, more often than not, just invest in large, stable, "blue-chip" companies, which is a good thing for investors, in my opinion, since it reduces volatility (big, sudden movements of the NAVPU) and results in funds that closely resemble the benchmark PSEi.